Summer is gone, taking with it the crazy hot days Rio is so used to. So, now that we can enjoy milder evenings, why not meeting up for a talk? 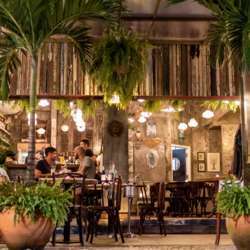 Let's see each other at Salomé Bistrô, a French bistro with a charming atmosphere right in front of the beach, just next to Hilton Copacabana. Where Brazilian and French dishes are served along sophisticated drinks. With its peculiar decoration, it's a place that entices us for a good conversation.